Prove yourself as the host with the most at your next dinner party with the timelessly sophisticated Stone dining collection. 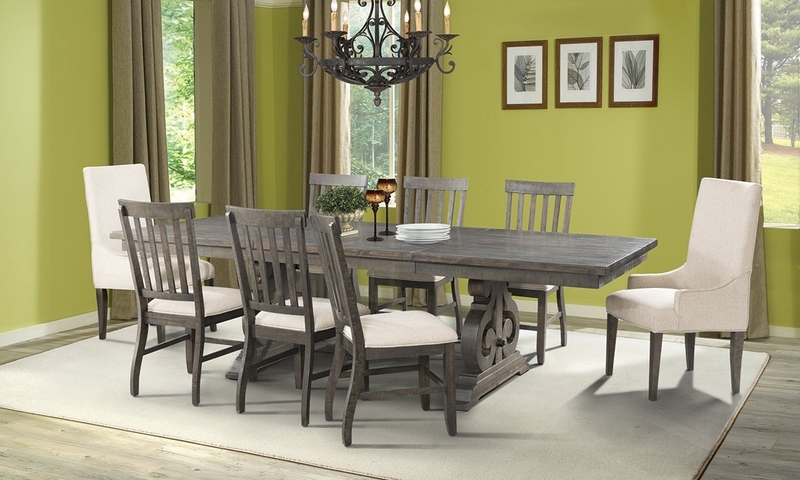 A dark ash finish offers modern allure to the acacia veneers used to craft each piece, further refined by the stylish reverse scrolls supporting the trestle table. With two included drop-in leaves, the table top extends from 76 inches to an impressive 112, providing comfortable seating space for everyone on your guest list. A pair of Parsons chairs perfectly punctuates this seven-piece set, tailored in the same linen-look upholstery as the cushion on each of the group’s four casual lath back chairs. Art for illustration: Set includes table, 4 side chairs & 2 Parsons chairs.